I recieved yet another request, for the information about the tube front end that was used on the Rat Patrol. I have never saved any of the responses that I,ve sent to people so maybe if I post it here I can just refer to this thread. I built the front end mount for the Rat Patrol and I could custom build another one but will not be as cheap as the SoCal front end that Speedway Motors sells. What you would get from me is a COMPLETE BOLT-ON KIT. If you are building your car on a budget or on the cheep, either go with the Speedway kit or build the mount yourself. These are the parts that I used for the Rat Patrol. They are Speedway Motors parts. The only thing that I had to modify was the hair pins. They needed to be shortened. I also needed to build the steering arms to bolt to the spindles. I think the new Speedway front end kit for VW's have every thing needed in one kit but I'm not sure. That kit is Part #910-34489 $799.99 and 913-39055 $899.99 I really don't know if they are using the axle that I recommend or not. The reason that I use that axle is so that I can run The 2 piston calipers for their modified Chevy spindles. The 4 piston units are way too much brake for the weight of a VolksRod front end and a stock VW master cylinder doesn't have enough volume to run the 4 piston brakes. Last edited by walt; October 7th, 2009 at 08:40 AM. Will put it in the tech bin later Walt, easier to find in less pages. Hello. This is probably a stupid question, but I'm new here so what ever : ) Can you please tell me a bit about the spring perch that seems to be really good? 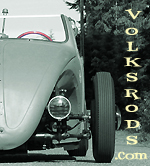 I can't get any info on this stuff in australia regarding volksrods so would appreciate any help. Do the Speedway motors I-beam kits include the whole axle/spindles/spring etc etc or just the crossmember and radius rods? I think I'll have to bite the bullet and make the long distance call. After all, it's for a good cause. There are 3 kinds of people in this world - those that can count and those that can't. The speedway kit includes everything except hubs and brakes. Careful though the I beam or tube axle kit does not include the crossmember. They are a little unclear on there website and or magazine, so you are looking at about 1800 bucks for the I beam setup on your car. This is what I have on my car. They also have pretty much zero instructions, but I was able to figure it out since my buddy has an old ford sedan with a drop axle on it. Hi airkooled, thanks for the info. Do the I-beams run the standard beetle discs/calipers or are the stubs based on early ford or something? Have you heard of many people running the beam extension, where it just mounts the standard front end 10 inches further forward? I've heard good and bad about each style, and assume the IFS stock front end is better, but I much prefer the look and feel of the I-beam and buggy spring. Beam extension route is easier/cheaper due to the use of standard VW parts. I don't have numbers, but think most of the vrods here have gone that route. There's some other alternatives too, like shortening the body, lengthening the framehead, flipping the tie rods, etc. Just dig around the site and you'll find a lot of good info. hi garlos, thanks for the info. To keep costs down I definitely think the beam extension is the winner. Is there anyone else who makes an extension that looks as good as pegleg? I've not had any of my emails returned from them and wonder if they're still there??? I've not had any of my emails returned from them and wonder if they're still there??? Thanks pm, that's good news. Of the few extensions I've seen, his is by far the best made one. We all got the bug for the bug. I beleive that pegleg is only making a 8 inch extender. But i beleive dbug41 is making a 10 inch exstender. They both are very nice depends on how far out front you want the wheels. If you go with a 8 inch you dont have to cut the hood but with the ten you need to cut for the steering box.